The day had started out sunny and bright as Jeff Messmer, Ranger Tugs’ vice president of sales, and I cruised the new R-29 across Puget Sound from Seattle to Roche Harbor in the San Juan Islands. As we cleared Admiralty Inlet and entered the larger, unprotected expanse of the Strait of Juan de Fuca, a cloud shield moved in overhead, and the wind freshened from the southeast. By the time we crossed the midway point on our heading for Haro Strait, the fast-moving storm had whipped the sound into a washboard of 3- to 4-foot waves. From my comfortable position in the helm chair to starboard, I had a fine view all around the compass. Four windshield wipers kept the front windows clear, working in concert with visors and drip rails to improve visibility. An inbound commercial ship in the Strait of Juan de Fuca that we spotted to port in between downpours also was headed for Haro Strait, but at 18 knots it didn’t take long to judge that we would be clear and ahead of her by the time we reached the southwest coast of San Juan Island. I pulled the throttle back to 8 knots in the lee of the island and admired the rough-hewn scenery all along the shore. Needless to say, I was having a wonderful time on what was proving to be a very real-world sea trial. The R-29 tracked superbly and required only the smallest amount of correction on the wheel to take advantage of the surging power of the waves, surfing ahead with ease. The boat neither pitched nor rolled to any degree that was uncomfortable or uncontrollable, and Jeff and I talked at length about the boat, her mission, and her designers to pass the time. The R-29 is the second cruising tug design from the board of Ranger Tugs’ chief designer, David Livingston. 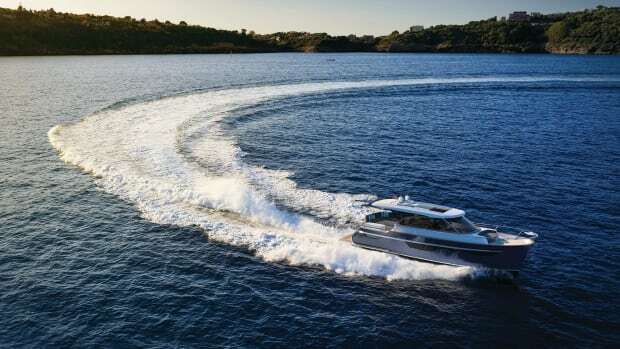 If at any point in your boating past you have owned or spent any time on boats from Bayliner, Wellcraft, Regal, or Reinell, chances are good that you have enjoyed the practical mix of workable layouts, good storage, and excellent performance that are characteristic of Livingston’s designs. 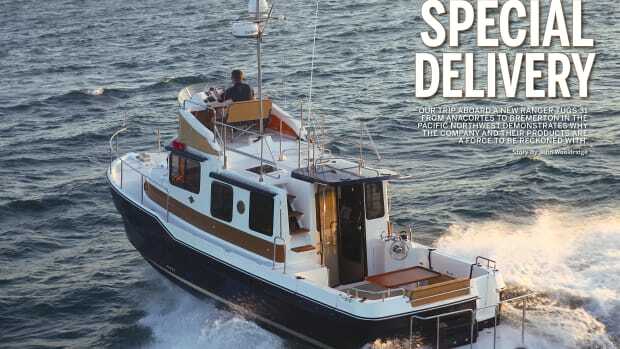 Working with his son, John, who serves as Ranger Tugs’ president, the two longtime boat enthusiasts and company owners developed the firm’s first trailerable trawler, the well-known R-25, to satisfy the demand for an affordable, compact pilothouse cruiser. Unexpectedly, they met with extraordinary success, selling 53 in the first six months after the model’s introduction in 2007. 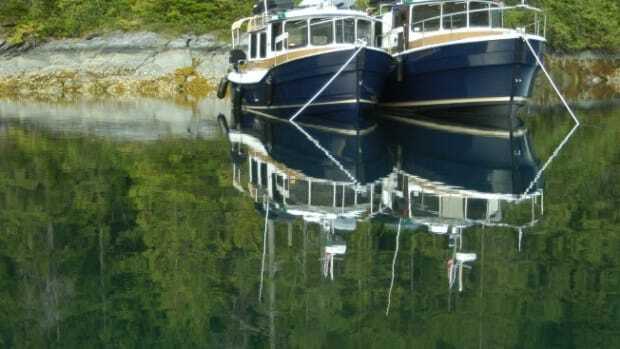 The pent-up demand for a smaller, simpler trawler for those just breaking into the sport continues well into 2009, and the number of interesting cruises by owners grows every month. Take, for example, the story of Ed and Elaine Henn, who traveled from Annapolis to Bradenton, on Florida’s southwest coast, and back—a 2,200-nautical-mile snowbird cruise. In January 2009, the new Ranger Tug R-29 made her first public appearance at the Atlanta Boat Show and, shortly thereafter, at PassageMaker’s Stuart Trawler Fest. Like her smaller sistership, the R-29 is legally trailerable, albeit with a proper tow vehicle and permit (no companion car required). Comparatively speaking, the R-29 is just 4 feet longer overall and 1.5 feet wider than the R-25, but differences in livable volume, storage, and amenities are distinct. Still within reach of those looking for an entry-level trawler, the tug also has the equipment and accommodations that interest those owners who are looking to downsize. The R-29 has a profile very similar to that of the R-25, and a similar on-deck layout. Depending on the height of the dock, boarding is accomplished via the deep, full-width swim platform through a starboard transom gate, or on the wide sides of the aft deck, down large molded stairs. Whichever path you choose, strong, well-placed stainless handrails are within easy reach, and I was particularly pleased to see tall rails and integral fenders along the aft perimeter of the swim platform. Long handrails on the cabin top are provided for moving forward along the side decks. The wide foredeck, with a good skid-resistant pattern, is enclosed by a bow rail. On deck, there is a 12VDC Lewmar 1000 SS windlass with deck and helm controls, an anchor locker, and a self-launching stainless steel bow roller. A large hatch (screened inside) on top of the forward cabin portion of the deckhouse provides additional access to the foredeck, as well as easy access to the antenna base and the 4-foot-2-inch-tall stainless steel antenna mast over the pilothouse, which folds down for improved bridge clearance. Spring and aft cleats are canted outboard and mounted on the deck edges for fairleads to dock cleats. On the side decks, about midway between the fore and aft decks, there are single-step ladders on each side for reaching kayaks or bicycles stored on a stainless steel sports rack. The aft deck of the R-29 is large enough to hold a portable cooler and a couple of folding deck chairs for relaxing at anchor or in the marina. To make the aft deck user friendly in more seasons, a bimini top with boot and side enclosures with Strato-glass are available as options. A raw-water washdown is standard. A convenience center molded into the transom features storage behind louvered teak doors, a pressure freshwater faucet and sink, as well as a deep, drained cooler with lid. An optional electric barbecue would make this unit a convenient outdoor galley. Additional storage is available underneath the molded steps on either side, accessed by opening the steps up and outward on hull side hinges, like opening a sports car’s gull-wing doors. With the step/doors held open by gas-assist struts, the locker spaces below reveal abundant storage for large items, as well as outstanding access to the batteries and charger, the 4kW Mase genset or a 2,000-watt inverter, and electrical switches. Under a centerline hatch, the 260hp Yanmar engine is neatly and cleanly installed, with terrific access to all four sides. The front half of the engine extends under the main cabin sole, with a dedicated hatch that allows you to check fluid levels and strainers without opening the aft deck hatch—a real plus on rainy days. 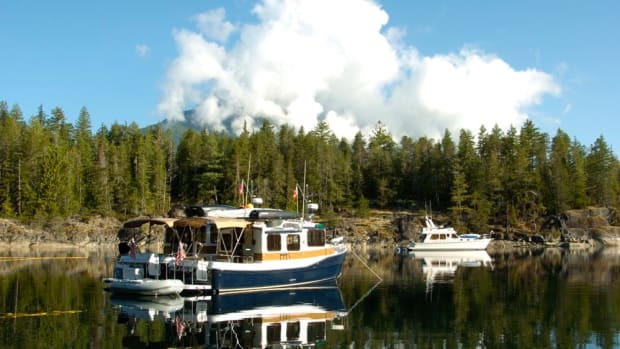 The standard boat is configured with six batteries and a 2,000-watt inverter, a desirable setup for those living in the Northeast or Pacific Northwest. 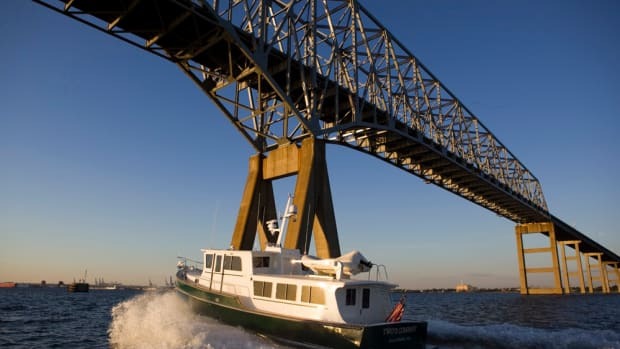 The owner of the boat I tested lives in the southeastern United States and chose the diesel genset and optional air conditioning (16,000 Btu in the saloon, 10,000 Btu for the master stateroom) and reverse-cycle heat. The entrance to the main cabin is through a full-length acrylic door that seals tight. Along with the twin windows on the aft bulkhead (one fixed, one opening and screened), the door provides a wonderful visual connection to the aft deck and outstanding views astern. Glancing around, there is no shortage of windows, and you’ll find excellent sightlines in every direction, whether you’re sitting at the dinette to port, preparing a meal in the galley to starboard, or enjoying the waters ahead from the portside double companion bench seat. 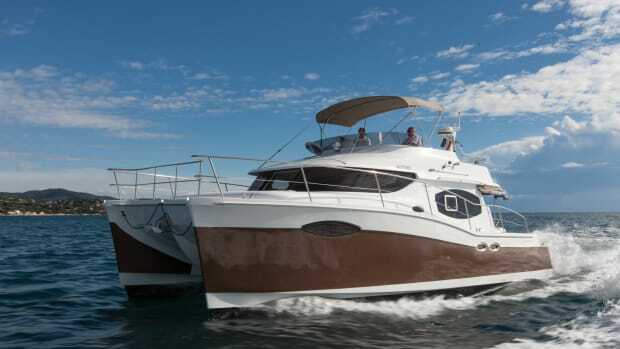 For added natural light and ventilation, there are four opening hatches in the cabin top—two over the helm and companion seats, and two serving the galley and dinette areas. Five additional sliding cabin-side windows and two opening bronze portlights, all with screens, help ensure abundant fresh air from most every quarter. Excellent thinking went into the galley layout, starting with a three-burner range (gas or electric) and including twin stainless sinks that make food preparation and cleanup far easier than with a single-sink configuration. A microwave/convection oven is positioned just beneath the range, and six storage lockers with slatted teak doors sit beneath the sinks and countertop forward. The helm seat base can tilt forward to create additional countertop space. Headroom in the galley, and in fact throughout the R-29 interior, is approximately 6 feet 5 inches. Underfoot, I appreciated the beauty of a teak-and-holly sole. On the port side, there is an entrance to a midcabin double berth that extends under the raised dinette and includes a folding acrylic door and a sliding overhead teak hatch. The master stateroom forward also features a privacy door and overhead teak hatch, meaning two couples can enjoy the cruise when desired. And if you’re really pressed, the teak tabletop of the dinette drops down to form another single berth with a filler cushion. This convertibility is possible because of the clever design of the companion seat, whose backrest moves forward when it’s time to dine or make up the berth, or aft when you’re ready to keep the helmsman on course. Comfortable seat cushions make the dinette a desirable spot for reading, card playing, or watching the world go by. There are so many good ideas incorporated into the helm station, operating the R-29 is a true pleasure. Ample space between the steering wheel and the seat allows comfort whether seated or standing, and there’s good access to the door to starboard. It’s possible for the helmsperson to lean out the door and loop a line around a cleat on a floating dock, or quickly reach the foredeck when necessary. Bow and stern thrusters are standard on the R-29, giving you complete control to pivot or move sideways easily and simplifying the docking or undocking process. They are powerful enough to make landing in a crosswind a simple task. Interestingly, the thrusters are mounted just aft of the single-lever throttle/shifter control, on a wood panel to starboard that slides aft for improved access to the side door and forward into a locked position for vessel operation. Tab controls are close by to help balance the boat in a cross wind. The teak console had plenty of room for the optional Garmin 5215 touch-screen multifunction display and autopilot on our test boat, as well as the standard VHF radio, system switch panels, remote control for the 6-inch spotlight, and the Yanmar digital engine monitor. The wood and stainless steering wheel was set at a comfortable angle for use when sitting or standing, and there was a footrest beneath for leg relief when sitting for long stretches of time. Stainless steel cup holders are mounted just inboard of the helm seat. Beneath the companion seat and facing the centerline, I noted an AC/DC 6-bottle wine captain on the boat I tested, while the 12-VDC refrigerator was just opposite. The master stateroom forward features a pleasant surprise: an island berth with easy access on either side and lots of storage beneath the lift-up aft end of the mattress. Having spent a restful night sleeping on it, I can attest to its comfortable support and its length—more than enough for my 6-foot-3-inch frame. A 19-inch color TV with CD/DVD player hangs on the bulkhead. The private head compartment is a fully molded component, one of several used in the overall construction of the boat to make it easier to care for, quieter than individual compartments and cabins, and precision fabricated for exact fit and finish. The Corian countertop is a nice touch, and there is plenty of room for dressing and showering. The following day dawned clear and bright, but advancing clouds to the east announced that our trip from Roche Harbor to Anacortes would not be completely dry. I bumped up the throttle to 3100 rpm, and the R-29 responded with quick acceleration and a smooth ride. We were making about 15 knots and burning 7.5gph, according to the Yanmar engine monitor, and as we began to cross Rosario Strait, a line of squalls hit us on the nose. The R-29 punched cleanly through the nasty, wind-whipped chop all the way up Guemes Channel, quartered the waves nicely as I made the turn for Cap Sante Marina, and surfed just a little before I took her down to idle. In my opinion, the Ranger Tug R-29 is an outstanding new cruiser. The base price of $214,937 includes a long list of standard equipment, much of which is typically found on larger vessels. The R-29 seems very capable, not only for weekend gunkholing but also for extended coastal cruising. Whether you’re shopping for a trailerable trawler or simply want to downsize, the Ranger R-29 is worth a closer look.